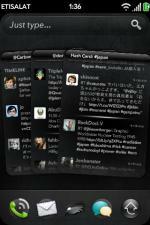 If you’re looking for a platform with excellent options for Twitter clients, then look no further than webOS. 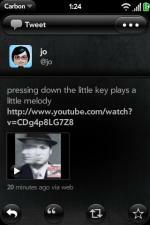 With seamless multitasking, unobtrusive notifications, and a loyal and enthusiastic (if small) fanbase, webOS is the place to be if the place you want to be is on Twitter. 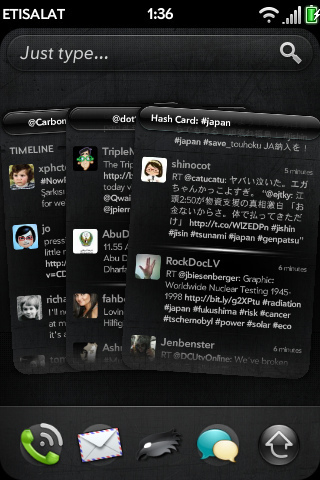 A few months back we previewed the beta version of a new Twitter client called Carbon, and today we’re pleased to be able to show you what the release version is all about. 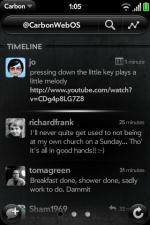 Carbon, by the developers at dots & lines based out of the United Arab Emirates, offers up Twitter in three panes (timeline, mentions, and messages) that you can swipe between with ease to view your messages. 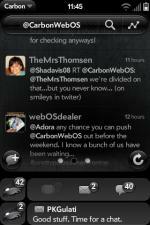 While that’s a simple enough concept, Carbon’s execution, expansive feature set, and dozens of little touches set it at the top of the webOS Twitter heap. So you’re wondering what makes Carbon so great? There’s a lot, really. It’s attractive, intuitive, powerful, and it makes your breath smell like oranges. So let’s get right down to it: Carbon is a swiping panes type app, with individual pages for your home timeline, @ mentions, and direct messages. 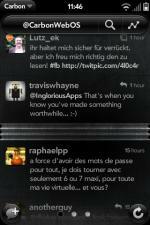 Getting between those panels can be accomplished by swiping across the screen or in the gesture area. Up at the top of each of these scenes is a bar from where you can find your own account information, search, and your choice of lists or trending topics, all viewed in a snazzy drop-down overlay. Back in the main timeline view, your tweets are marked by a light blue line along the left side, while mentions of you (from people you follow) are marked by a yellow line on the right. At the bottom sits a new tweet button that will either open the compose scene, either in the current card, or if you’ve set it so, in a new card. Or you can just start typing to start a new post, totally up to you. The refresh button to the right slides in a slick refresh pinwheel on the side that lets you continue to read and manage your timelines even as it loads new content. Once that new content is loaded, Carbon will (based on your preferences) load itself to the oldest or youngest of the newly loaded tweets. And if Carbon detects a “gap” (i.e. it loaded the most recent X tweets, but that wasn’t enough to fill in up to the last tweet from your previous load), it will note that and insert a Calendar-style accordion fold that you can tap to load the tweets to fill the gap and make your timeline whole. If you’re filling in the gaps, chances are you’re going to be viewing a lot of tweets. If you’re looking to get to the top or bottom quickly, Carbon was the first app to integrate a new function called “power scroll,” wherein a swipe up or down with two fingers will jump to the top or bottom of the list. The dots & lines team has since released the code for power scroll and it’s been integrated into other apps such as Internalz. So you found a tweet you like and you want more from it. 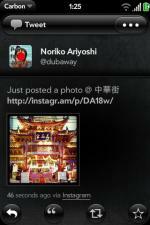 Tapping on a tweet opens a details scene with a plethora of options. 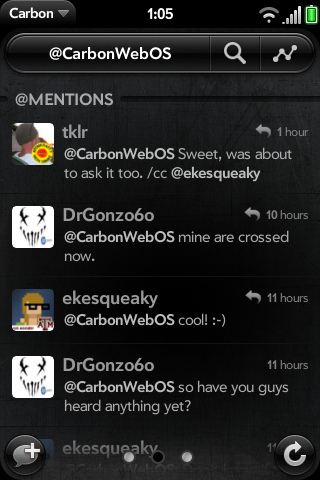 If it’s a tweet that’s a reply, Carbon does the obligatory and loads the conversation chronologically below that. 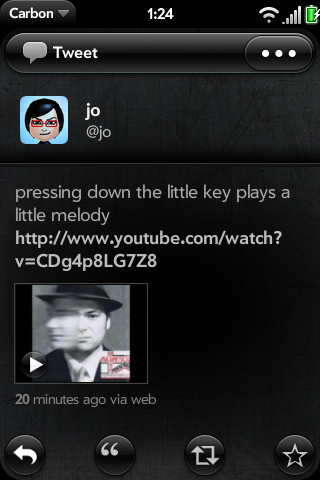 If it’s a tweet with an image or video, Carbon will slap a preview right below it, and videos that are hosted on YouTube or YFrog open directly to the video without opening any extraneous browser cards. 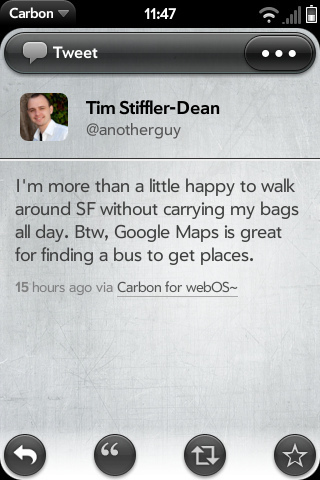 If a tweet has location data or a foursquare link, a narrow map view is displayed below the tweet, and links to foursquare will open directly into the webOS foursquare app if installed. 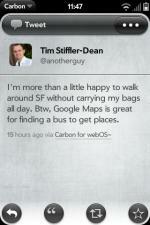 Along the bottom of the tweet view is a row of buttons to reply, quote, retweet, and mark as favorite. 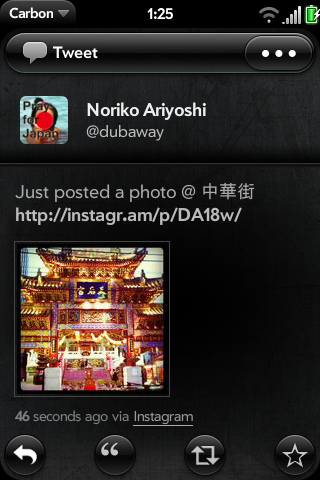 Unlike most Twitter clients, where you’re either forced to cho0se a retweet style in preferences or every time you post, Carbon separates the new Twitter-style retweet and the old-school post-it-yourself retweets into two separate buttons (quote being the latter). Quote gives you three style options: RT @user, (via @user), and straight quote marks; and you can set your preference of have Carbon ask you each time. 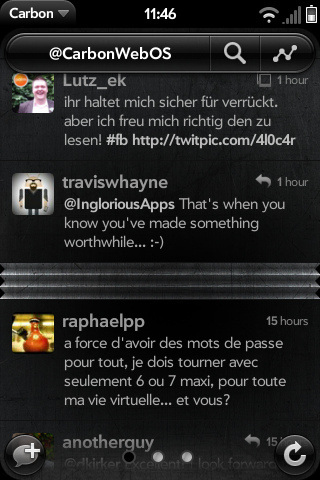 Across the top of the tweet view is a bar that opens a drop-down menu with choices to message that user, copy the tweet itself or a link to the tweet, share via Email or Messaging, translate into your set language, or add links in the tweet to the read later client you set in the preferences (Instapaper and Read It Later). And, of course, tapping on the poster’s name or avatar, or any username in that tweet, will open their profile with even more options. If you’re starting to get the idea that Carbon is packed with features, then you might be on the right track. There’s even more beyond that. 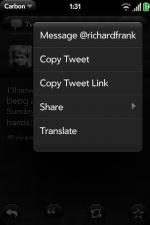 Carbone 1.2.0 (the release version) includes support for Just Type search and allows you to start a new tweet directly from Just Type with a Quick Action. That Just Type-triggered compose scene opens in a new card that is automatically dismissed upon submission, sending you right back to where you started. 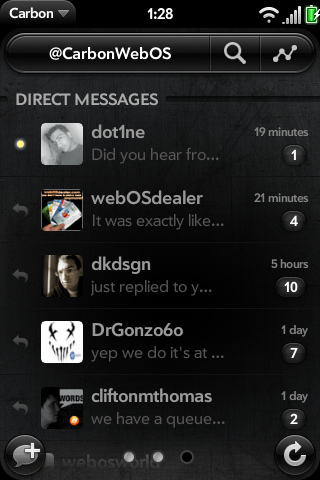 There’s also threaded message view for your direct messages and support for multiple accounts in multiple cards. Notifications are of course supported, and if you happen to receive multiple types of notifications (say mentions and messages), Carbon splits them into separate tappable items in the same dashboard bar. 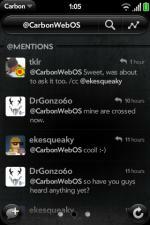 If you happen to have multiple accounts running, Carbon will split them into separate notifications. Then there’s the #hash card. What this does is opens a new card with a user-specified search term that refreshes at a user specified interval (between one minute and fifteen minutes). It’s very useful for tracking things like ongoing events, all while allowing you to continue on with your regular Twitter usage. All of this is focused around the functionality of Carbon. 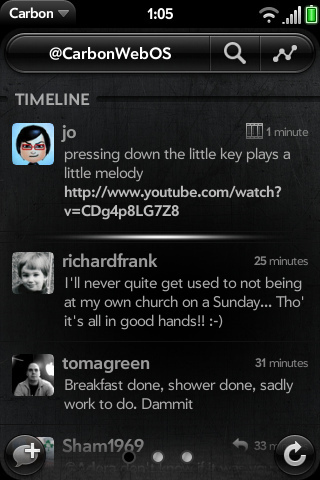 We haven’t even touched on how the app looks, which is to say it’s beautiful. 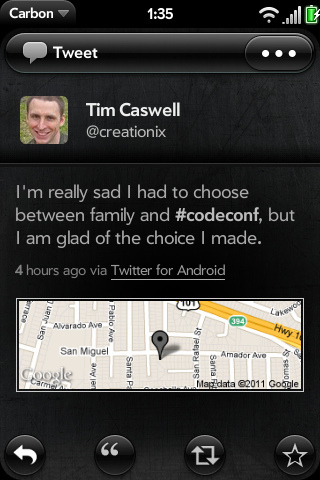 The beta release of Carbon featured a single dark theme of blacks and grays with white text. The textured background, tiny grid overlays, the three little dots along the bottom of the timelines to signify where you are in the chain of swipe-able views, the little smiley face emoticons accompanying the action-completed notifications... there are so many little touches in the design of Carbon that make it great. And now with the public release, Carbon adds a new theme called Oxide (the old is now Coal) that flips on the light switch and goes all white and light gray on us. After using the dark-themed Carbon beta for the past few months, it took us a while to get used to the light theme, but we kind of like it. The brightness does wash out the blue and yellow lines that subtly noted your tweets and mentions of you, but apart from that we rather like it. This is just the first full public release of Carbon. 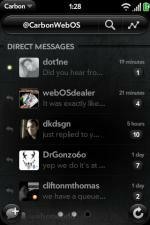 Though dots & lines is working to bring the app to Windows Phone 7 as well (the swiping panels UI will fit right in on that platform), they’re also hard at work building the next version of Carbon for webOS. Included in upcoming releases you can expect full support for geotagging and Twitter Places, Exhibition mode and landscape viewing, tweet scheduling, a list card to go along with the #hash card, local trending topics, and a colorful new “Diamond” theme. 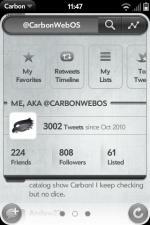 It’s clear that dots & lines put a lot of thought into how to make Carbon work, and for their first webOS app it’s a stunner in both aesthetic and functionality terms. Carbon blows away the competition with the myriad options provided to make it function the way the user wants it to. 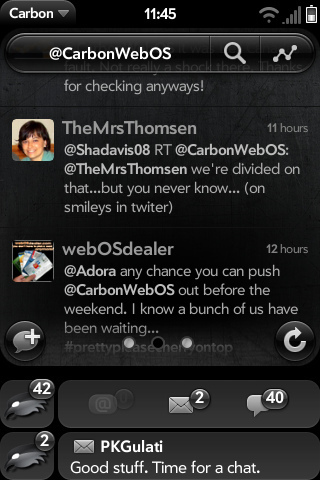 The verdict on Carbon is an easy one: this is one of, if not the single best, Twitter clients on webOS. Hands down, it’s fantastic. 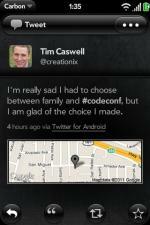 Carbon is available from the App Catalog for $2.99. It’ll be money well-spent.